For the first time the artists at Sewells Farm Barcombe will be opening their studios to the public for Artwave 2015. 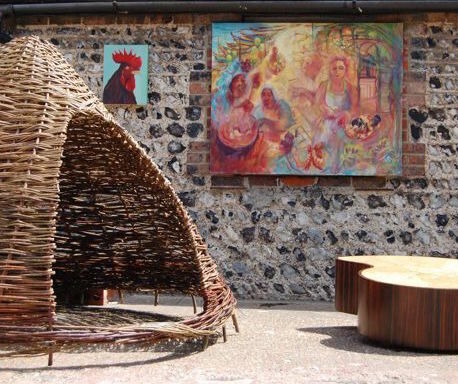 Over the weekend of the 5/6th of September, 11 – 4, come and see why such a diverse group of artists have chosen this beautiful secluded location as a place to work, and draw inspiration. Meet Philomena Harmsworth whose recent exhibition at Farley Farm House saw her canvases hung in rooms where giants of Modernism, such as Picasso and Lee Miller have lived and worked. Philomena views her own studio space as an extension of her intriguing, sketchbooks. Together they create the anchored point from which the narrative of her work can evolve. In contrast Sandra Hurst Chico found paper and canvas too confining for her ideas, so she turned to Willow as a medium to create, as she says, ‘giant 3D sketches’. Growing and coppicing, dry or living, Sandra’s work explores all aspects of the weaving craft. She shares her knowledge and expertise in private tutorials, school workshops and community projects. Mark Griffiths finds the inspiration for his furniture designs in sci-fi, and 1930’s Hollywood, which is evident in both his Shell table and Triffid lamp. Along with creating contemporary pieces, Mark’s woodworking skills have recently led him to be involved in a project to recreate an Iron Age dug out vessel discovered in an Irish bog, using simple tools from the period. Join them at Sewells Farm for a weekend of conversation, discussion, refreshments and wonderful works of art.